Agricultural Options for Small-Scale Farmers features selected content from the first 100 issues of ECHO Development Notes, a quarterly technical bulletin targeted towards ECHO's international network of development workers. It is a book filled with practical options for helping resource-poor, smallholder farmers and urban gardeners--in the tropics and subtropics--to produce the food they need under the difficult growing conditions that they often face. 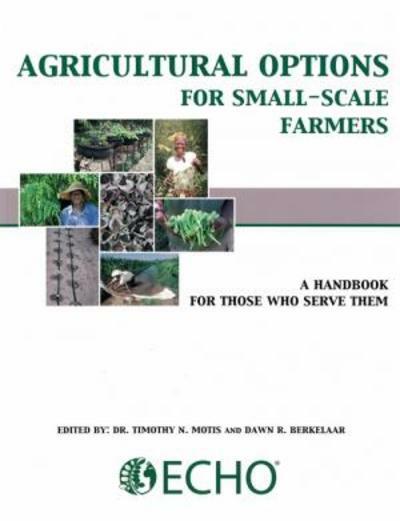 Agricultural Options for Small-Scale Farmers also contains material written by experienced practitioners on agricultural systems they have implemented in the field and that have been adopted by thousands of farmers. How can we help the farmer who must survive on a small parcel of degraded land without water or a means to purchase fertilizer? Information is abundant, but how does one sort through it all to find out what interventions will really make a difference? This is where perspective is so important, and the best way to gain it is to connect with like-minded people who have the benefit of experience.Foundational concepts, such as the weaving of agriculture and community development, are covered in this publication. It contains insights on research to be undertaken, as well as factors and issues to consider, before investing valuable resources in specific project interventions. How can we help the farmer who must survive on a small parcel of degraded land without water or a means to purchase fertilizer? Information is abundant, but how does one sort through it all to find out what interventions will really make a difference? This is where perspective is so important, and the best way to gain it is to connect with like-minded people who have the benefit of experience.This publication covers practical, project-oriented agricultural options for restoration of unproductive soils. How can we help the farmer who must survive on a small parcel of degraded land without water or a means to purchase fertilizer? Information is abundant, but how does one sort through it all to find out what interventions will really make a difference? This is where perspective is so important, and the best way to gain it is to connect with like-minded people who have the benefit of experience.This publication covers practical, project-oriented agricultural options for coping with scarce rainfall. We hope that the perspective found in these ebooks will help lead to improved livelihoods of small scale farmers around the world. Please let us know how their content contributes to your efforts to serve those in your community.